Very good tip! I am moving next month after being in the same house for 10 years. This will help me. Red is also my happy colour. One year I spray painted my plastic patio pots fire engine red and it made me happy every time I looked out the glass door. It’s funny how a color can make such a difference. When we moved in our laundry room was a rusty orange. Once it was painted it felt so much better to be in there. Happy moving! It’s been nice for me to start on a clean slate especially since my style has changed quite a bit since we were first in our old house. My front door is that beautiful red! I knew that trick but you know me… lazy and impulsive to the core!! Looks great! I love the bench on that side. Where did you get the artwork? The artwork? A little own artist that lives right here in my own house – hahahahaha! Your sister is very clever and I will be stealing that tip when I can persuade my man that we really do need to hang stuff on the walls that were painted almost two years ago!!!! That finished shot of the pictures looks like something out of a posh magazine! Well done. I love green – a lot – but for really happy and especially for a door, Yellow. I like that picture arrangement! 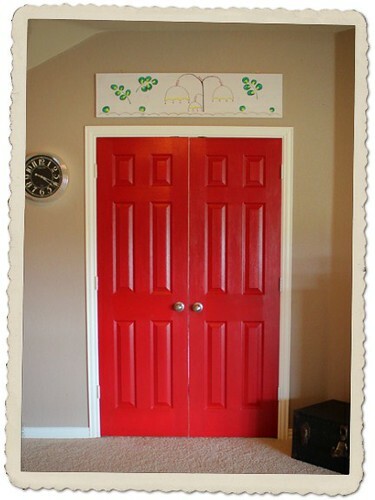 And the red doors! Very nice. I like the new spot for your “crying uncle” bench. Hmmm, you are very brave. White carpet. How do you keep it clean with boys? I am slowing making every floor in my house some variation of “dirt colored”. Have a happy day. Red. Red is my happy color. I love your red doors. Suddenly, I have the urge to paint. Hello! I have not been here for a while…fun to catch up! 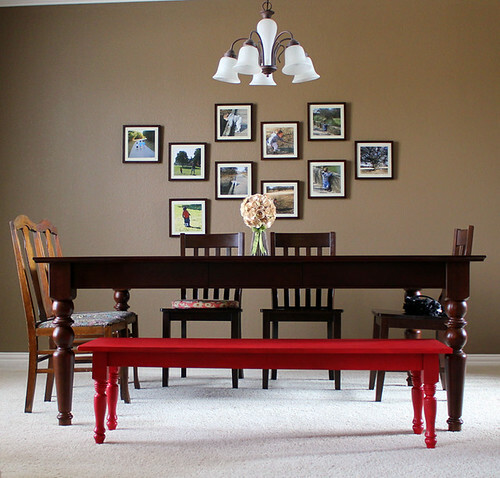 I am loving that red door and red bench! Love the tip. I will be using it when I hang the my family pictures this summer. Thanks! I have been in our house for 30 years and still have lots to do to make it warm and inviting. I’m loving your photo collage .. A Stunning display! 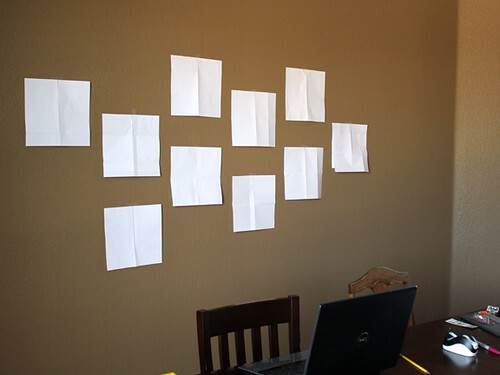 For all the times I have moved in my life and forced my husband to hold up pictures while I stood across the room, this paper idea has never occurred to me. It’s so stunningly slap-upside-the-head simple! We’re moving again in a few weeks, so this time dh won’t lose all the feeling in his arms while I decorate! red is definitely my happy color too!!! I am in love with that beautiful red bench. I recently painted an old Charity shop found sideboard Turquoise its amazing what some spray paint can do for an unloved piece of salvaged furniture.